Commissioned at U.S. Naval Base, Norfolk, Virginia. Her mission is to destroy enemy ships, primarily submarines, and to prohibit the employment of such forces against the United States; she is also capable of conducting strike warfare missions, mine warfare, combat search and rescue, coastal surveillance, and maritime interdiction missions. 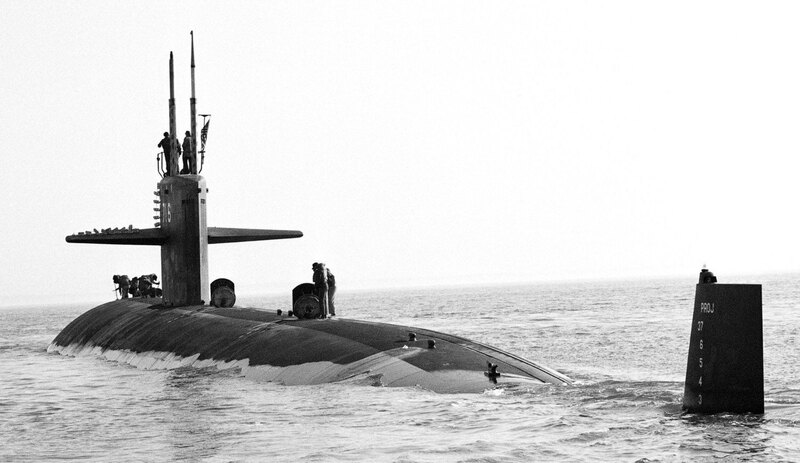 Underwent post-shakedown availability at her builders yard, during which time she received modification of the sonar to the AN/BQQ-5C sonar suite. Sailed from Norfolk, bound for the west coast of the United States; Salt Lake City transited the Panama Canal on 8 May, chopped [reported for duty] to the Pacific Fleet on 12 May, and reached her new home port, San Diego, California, on 22 May. Completed two months of operations in the Pacific Northwest (Puget Sound Nanoose Range areas) that included technical and operational evaluation of the new advanced capacity (ADCAP) Mk. 48 torpedo. Salt Lake City returned to San Diego on 15 October. 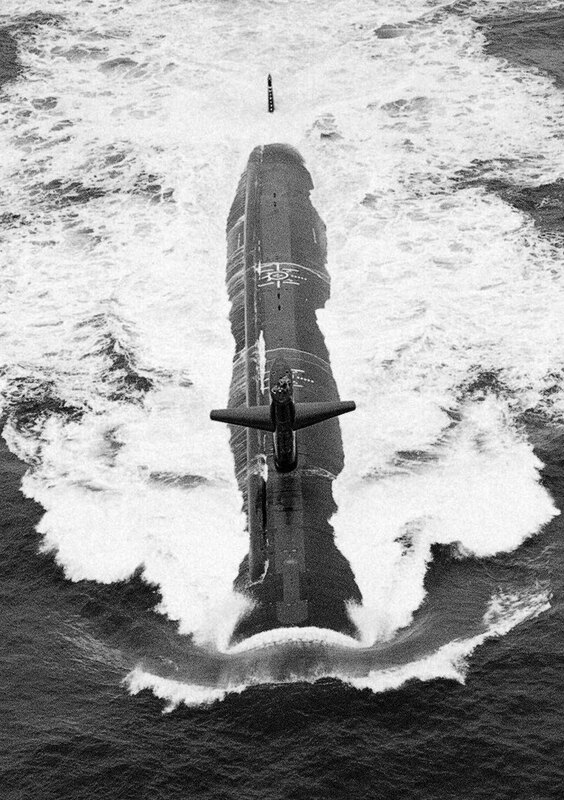 Departed San Diego for her maiden western Pacific (WestPac) deployment on 28 April. After pausing at Adak, Alaska (5 May) for minor voyage repairs, the boat crossed the international date line on 6 May. 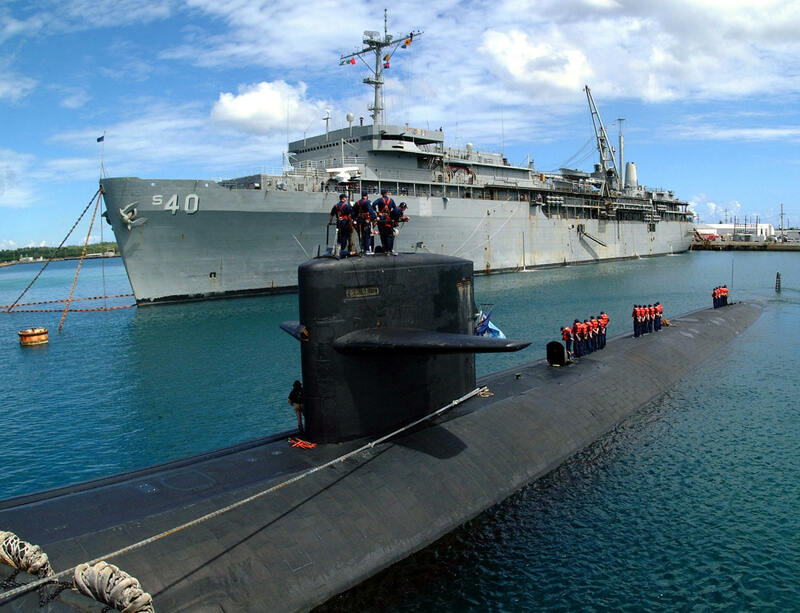 Salt Lake City reached Apra Harbor, Guam, on 25 June to commence three weeks of upkeep, after which she resumed underway operations. She arrived at Chinhae , South Korea, on 17 September to begin a three-day port visit, before moving on to Subic Bay, which she reached on 24 September. 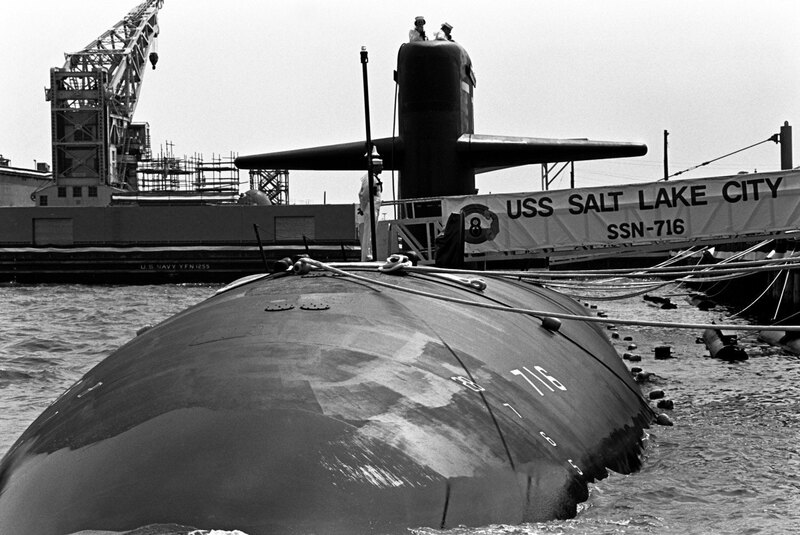 Ultimately, Salt Lake City returned to San Diego on 27 October; she began a 30-day stand down the next day. 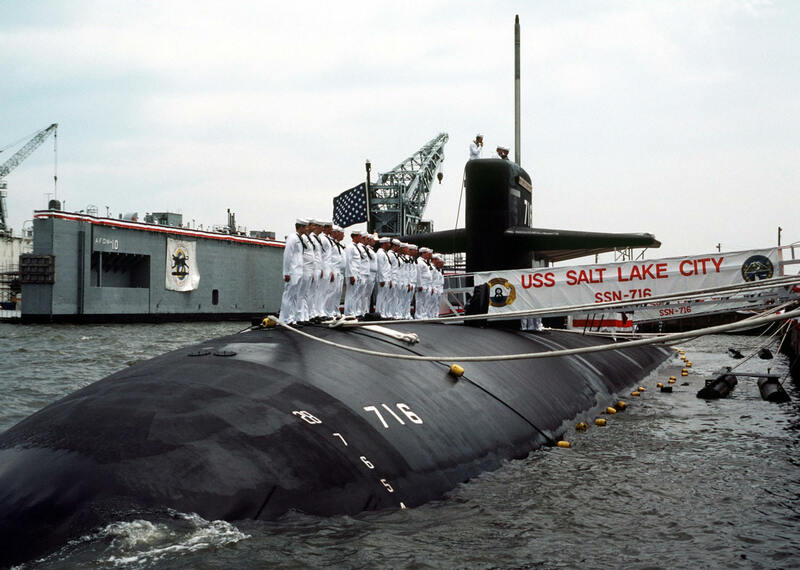 For her work during that deployment, Salt Lake City subsequently received a Navy Unit Commendation (NUC) (28 April 1987). During this period, Salt Lake City completed a month of operations in the waters of the Pacific Northwest (31 January), underwent her first selected restricted availability (SRA) (23 April - 5 July), successfully conducted an operational test launch of a Tomahawk cruise missile (10 July), and received a visit from ADM David E. Jeremiah (Commander in Chief, Pacific Fleet) (CinCPacFlt). Salt Lake City conducted her second WestPac deployment (19 January - 15 July) (for which she would receive her second NUC) during this time, a tour punctuated by visits from VADM Paul Miller, Commander, 7th Fleet (24 February) and VADM C.H. Kim (Chief of Naval Operations of the Republic of Korea Navy) and ADM Jeremiah, CinCPacFlt (14 April). The boat hosted Secretary of the Navy William Ball (5 August), and later conducted CNO Project Operations in the waters of the Pacific Northwest , completing these on 1 December. 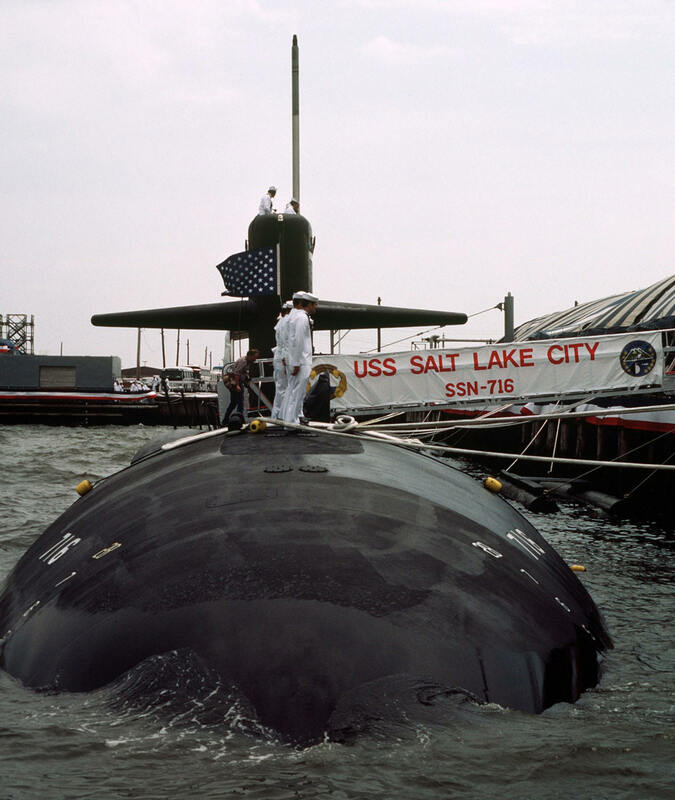 During the year, Salt Lake City participated in the filming of the Paramount Studios motion picture The Hunt for Red October. 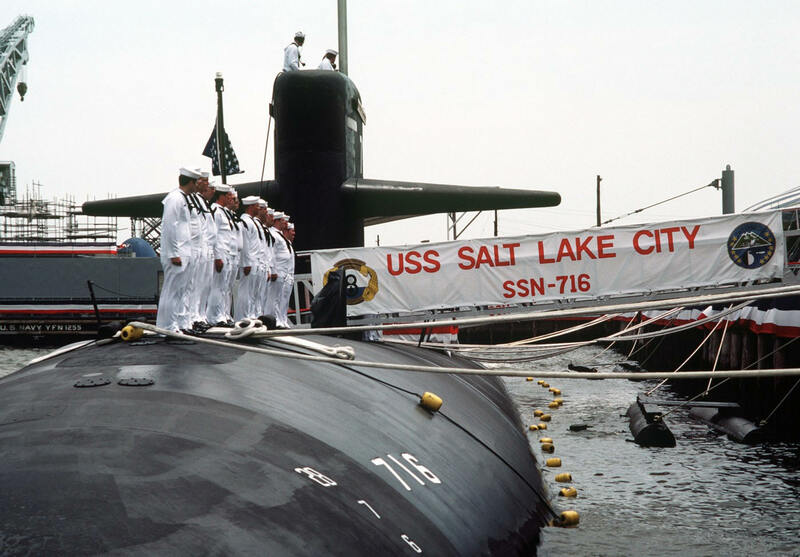 Operating out of San Diego, Salt Lake City hosted principal actors and production people from Paramount Studios The Hunt for Red October (19 March), and subsequently deployed to the western Pacific for two months, returning on 21 June. 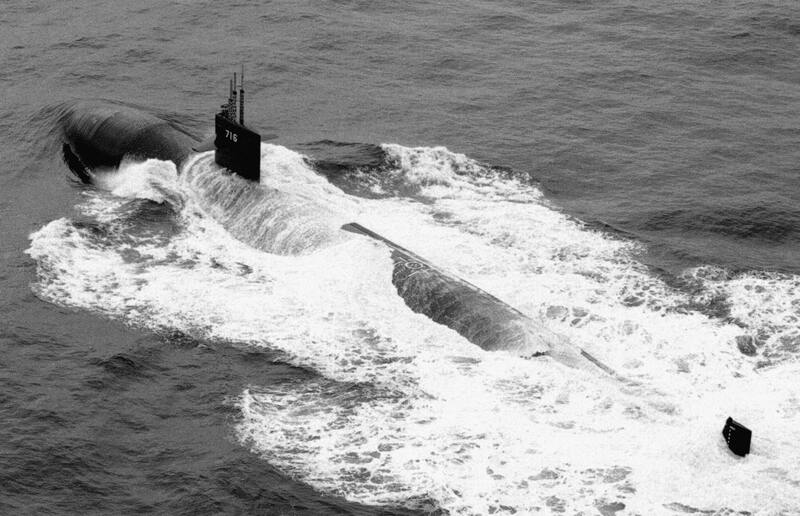 She completed a two-month SRA on 14 September, and represented the Submarine Force at Fleet Week 89 at San Francisco, California (7 October). 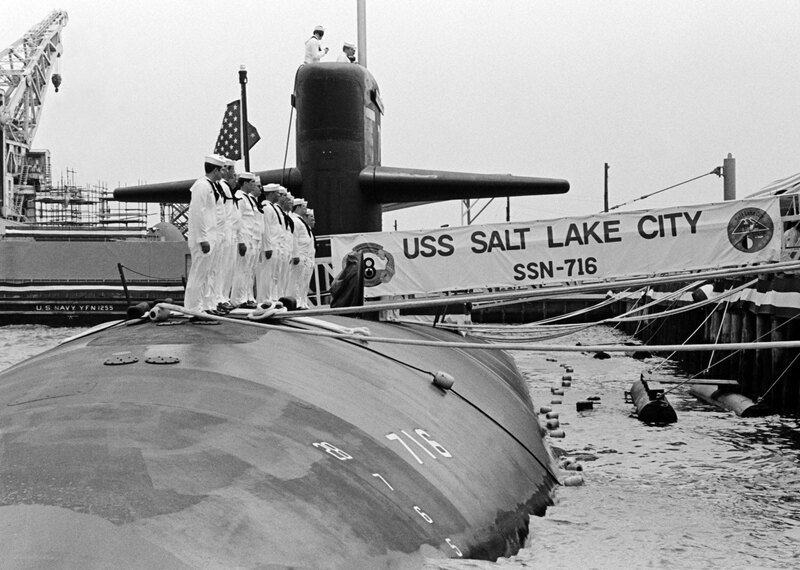 During this time, Salt Lake City conducted her third major WestPac deployment (12 February - 23 August). 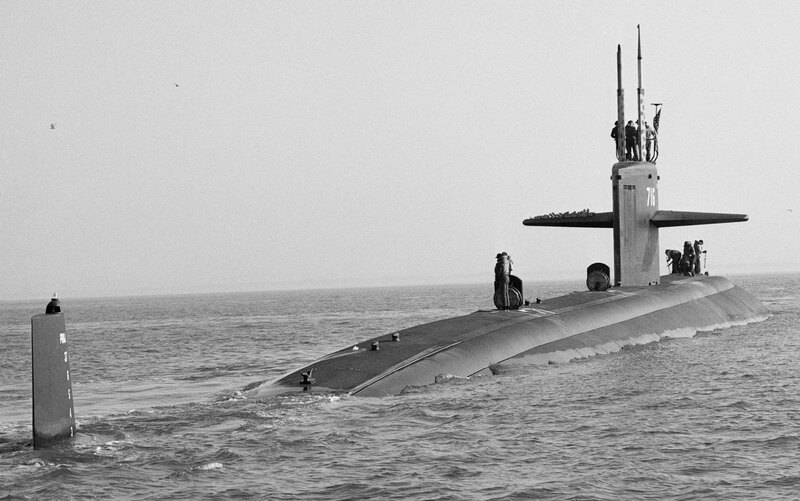 She commenced a two-month deployment to those same waters on 28 November. Salt Lake City returned to San Diego from her WestPac deployment on 25 January. 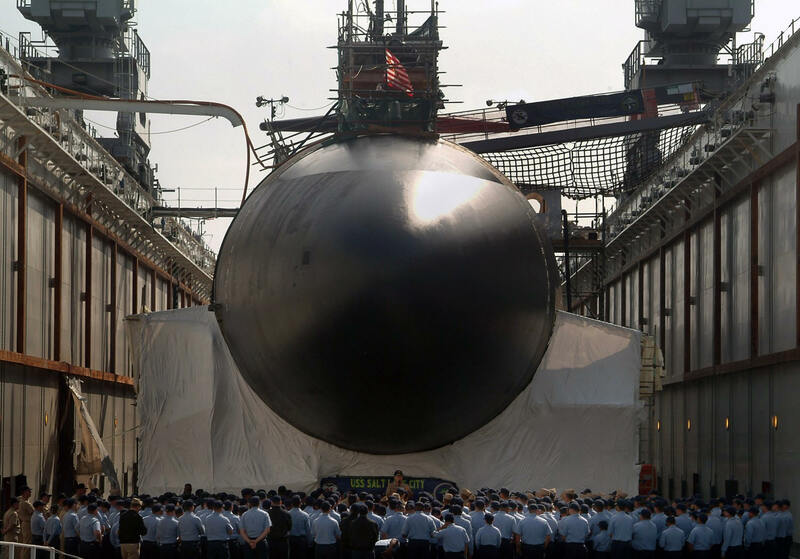 The boat completed a pre-Depot Modernization Period at the Trident Refit Facility, Bangor, Washington, on 19 August, and ultimately arrived at the Mare Island Naval Shipyard, Vallejo, California, on 18 October, affecting a temporary home port shift simultaneously. Soon thereafter, on 1 November, she began a Depot Modernization Period. Undergoing Depot Modernization Period, Mare Island Naval Shipyard, Vallejo, California. After returning to San Diego , Salt Lake City operated locally out of her home port; she completed an eight-week availability and drydocking on 6 October, and, on 24 November, completed a six-week underway period that had been punctuated with port calls to Bangor, Washington, and Victoria ,British Columbia. Salt Lake City departed San Diego on 24 June 1994 for her fifth WestPac deployment, as a unit of the battle group formed around carrier Kitty Hawk (CV-63). She provided ASW and ASUW support during the pre-deployment workups and during the transoceanic transits, and called at Yokosuka , Japan ; Chinhae; Hong Kong; Singapore; Pattaya, Thailand; as well as Guam and Pearl Harbor. During this period of operations, her real world prosecution of one of the most modern non-US submarines (the battle group encountered both a Chinese Han-class boat, as well as a Russian Oscar II class boat, the latter on 7-8 July, during the deployment) proved truly superb and earned her a well done from CAPT Timothy W. Lafleur, Commander Destroyer Squadron 17. Also during the deployment she hosted U.S. Ambassador to Singapore Timothy A. Chorba (22 October) and GEN Mongkong, Deputy Chairman of the Royal Thailand Joint Chiefs of Staff, and other high-ranking Thai military officials (1 November). 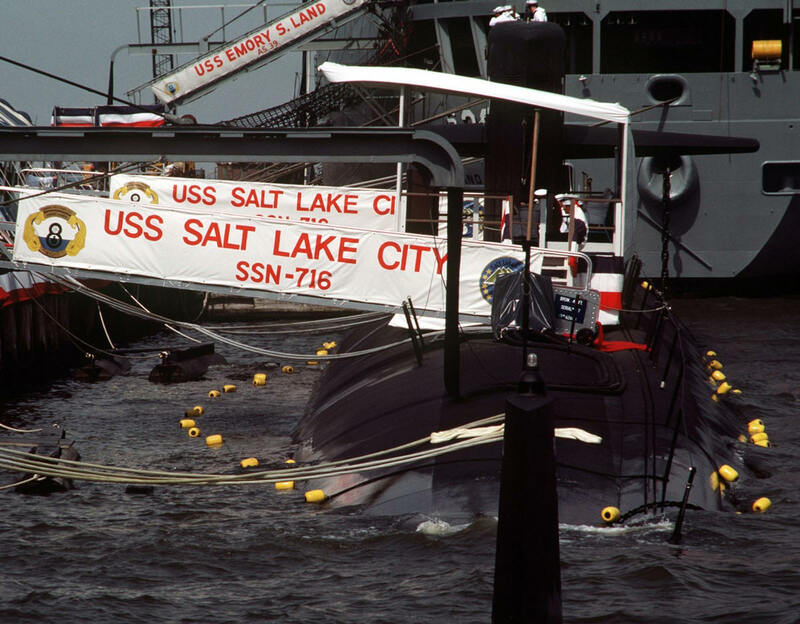 Salt Lake City returned to her home port three days before Christmas of 1994. 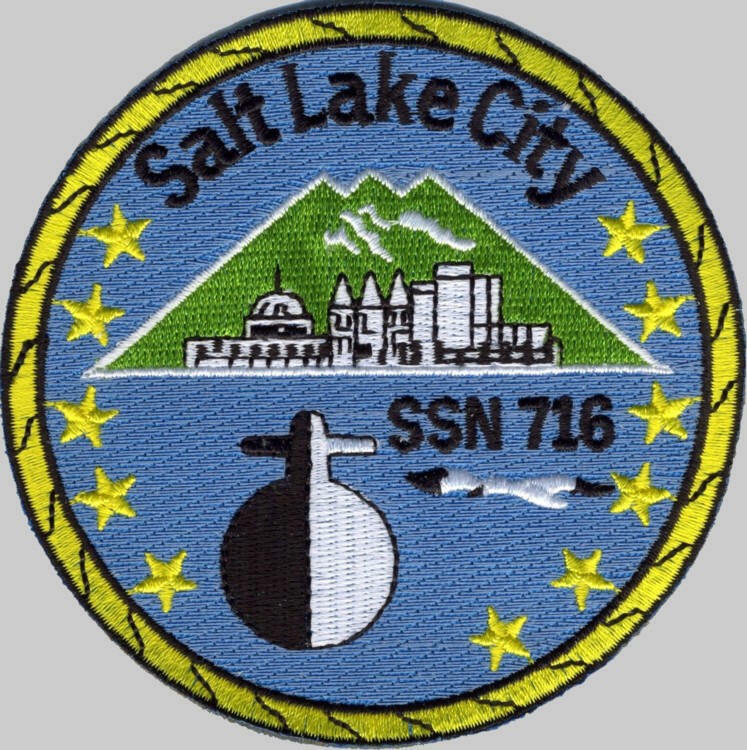 Salt Lake City operated locally from San Diego during the year, punctuating that time with participation in RimPac 96) (1-15 June), and capping the period of local operations deploying on 11 October for the western Pacific as part of the Kitty Hawk (CV-63) Battle Group. In the Pacific and Indian Oceans, and in the Arabian Gulf, she supported battle group operations in those waters, including Operation Southern Watch, maritime interdiction operations to support United Nations sanctions against Iraq, and served as a ready weapons platform. 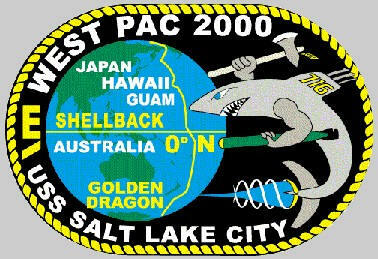 Salt Lake City returned from a six-month WestPac deployment (9 April 1997), during which time her officers and crew became Golden Shellbacks while simultaneously transiting the International Date Line and the Equator following a visit to Brisbane, Australia, and the ship distinguished herself during Exercise Tandem Thrust 97 with Australian Navy units. She then operated locally from her home port for the remainder of the year, a period highlighted by operations with the Abraham Lincoln (CVN-72) battle group (8-12 September 1997). During a nuclear weapons regeneration exercise (22 September -17 October 1997), Salt Lake City fired a Tomahawk cruise missile in support of Operation Global Guardian (28 September). The boat entered the medium auxiliary repair drydock Arco on 31 October 1997. 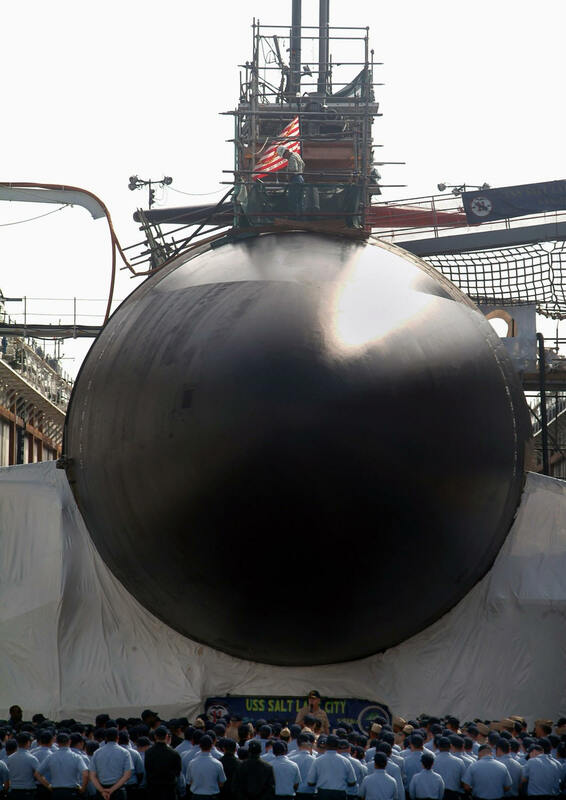 After completing her drydock availability in Arco (31 January), Salt Lake City alternated periods of local operations in the Southern California Operating Area with maintenance alongside submarine tender McKee (AS-41) (21 February-30 March and 6 May-12 July), capped by a pre-overseas movement certification (7-21 August), and deployment to the western Pacific on 4 September. 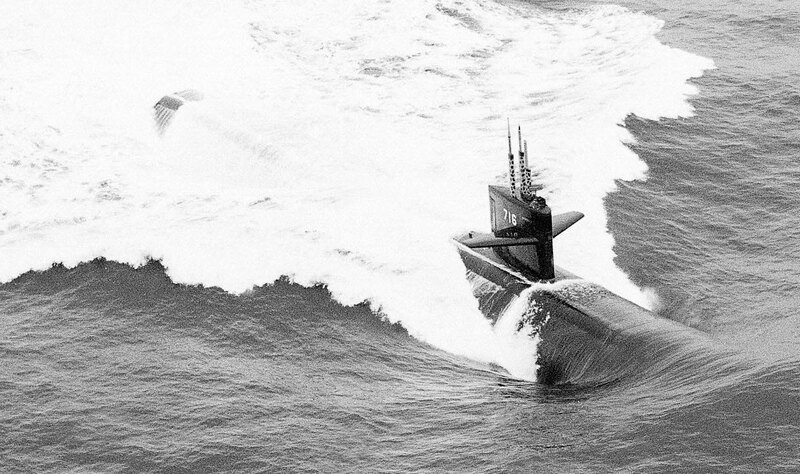 During that deployment, during which she conducted two extremely sensitive missions of vital importance to national security, Salt Lake City visited Pattaya, Thailand, for liberty (25-30 October) and underwent maintenance availability alongside the submarine tender Frank Cable (AS-40) at Guam (6-13 November). She returned to her home port two days before Christmas of 1998 (23 December). 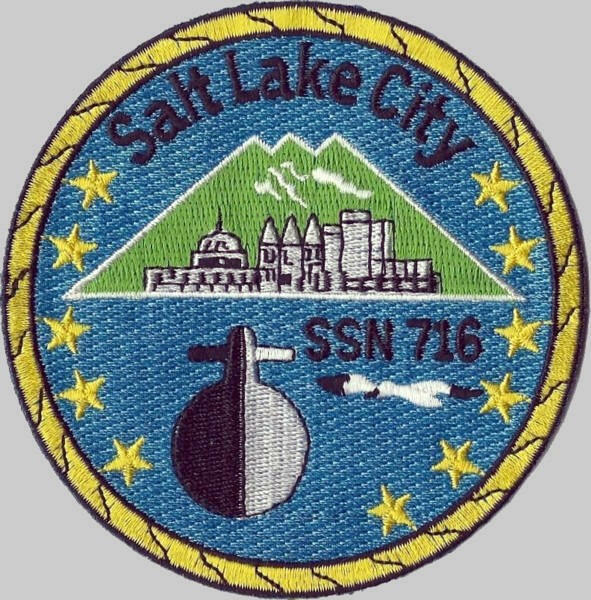 Following her post-deployment and new years stand down that lasted until 18 January, Salt Lake City underwent tactical weapons proficiency, phases I and II (19 January-10 February), then ships force upkeep that preceded an SRA on board Arco (22 February - 12 April). Over the following weeks, she completed her SRA and alternated periods of ship’s force upkeep with sea trials. Following acoustic trials (18-25 May), Salt Lake City conducted a liberty port visit to Esquimalt, British Columbia, Canada (26-31 May), after which she resumed local operations at sea out of San Diego over the next six months. 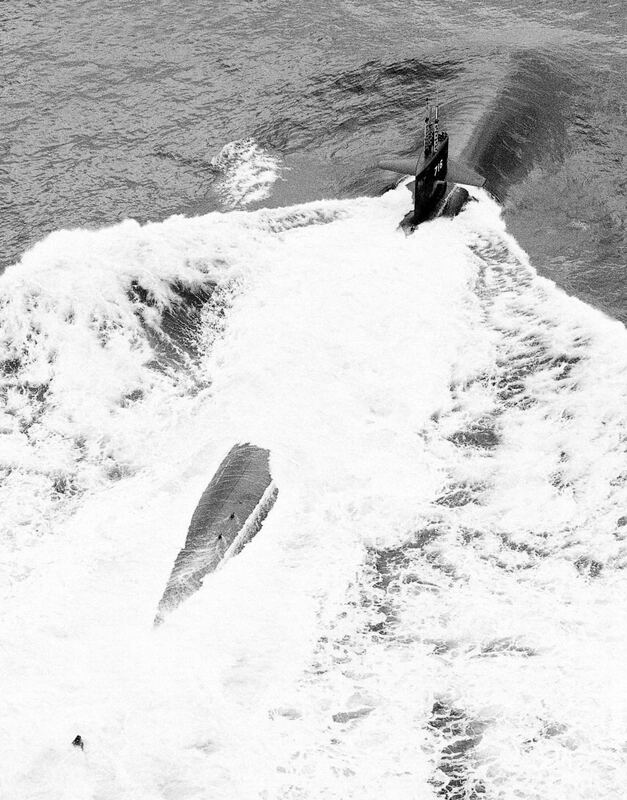 Participating in a FleetEx (3-8 November) preceded another cycle of local work and in-port periods, capped by a torpedo exercise and a transit to Pearl Harbor (29 November - 7 December). Following a port visit to Pearl (8-11 December), the boat transited back to San Diego (12-17 December), where she remained for the rest of the year. 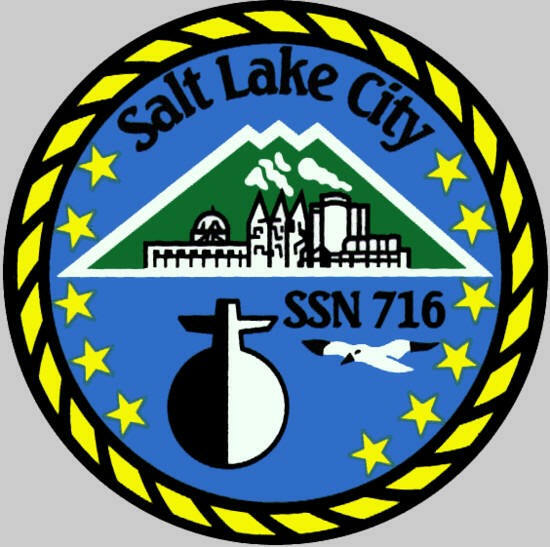 Salt Lake City began the year in a standdown/upkeep status (1-25 January), after which she underwent sea trials (26-28 January), followed by ship’s force upkeep (29 January-6 February), pre-overseas movement certification (7-16 February), and a WestPac load-out (17-29 February). 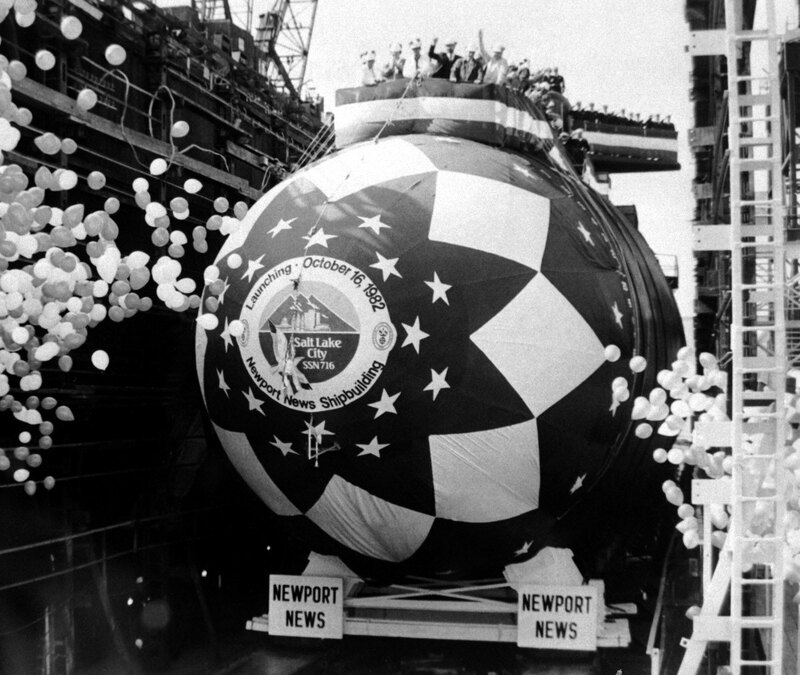 The boat deployed for the western Pacific on 1 March. 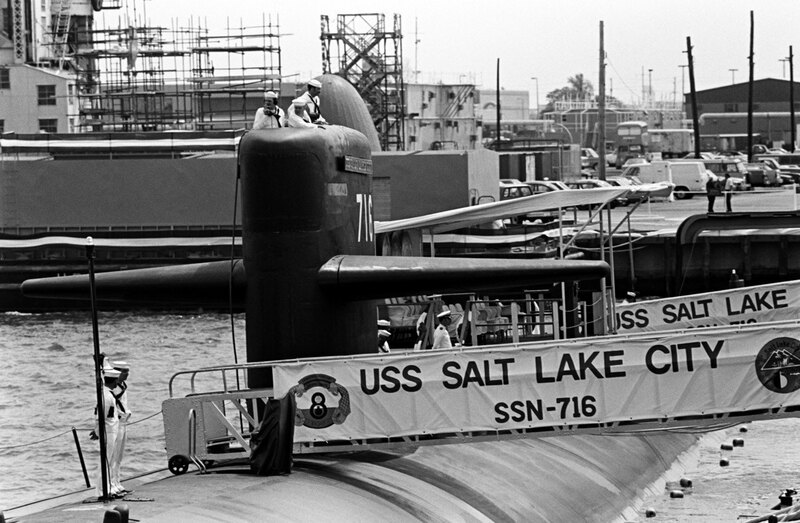 During the deployment, Salt Lake City carried out three missions “vital to national security, punctuating those operations with port visits and upkeep at Pearl Harbor (6-8 March), Yokosuka (16-17 March), Sasebo (5-9 April), Guam (27 May-3 June), Gladstone, Australia (10-15 June), Hobart, Tasmania (23-28 June), Chinhae (20-24 July), and a return visit to Yokosuka (14-28 August), the latter two periods (Chinhae and Yokosuka) involving her receiving maintenance availabilities alongside the submarine tender Frank Cable. During the transit between Gladstone and Hobart, Salt Lake City operated in concert with Royal Australian Air Force Lockheed P-3 Orions. The boat returned to her home port (7 September), where she remained, enjoying a post-deployment stand down (7 September - 8 October), a period of maintenance (9 October-12 November), and completing phases I and II of tactical weapons proficiency certification (13 November - 7 December). A final period of local operations (11-15 December) punctuated the final month of the year 2000. Salt Lake City punctuated her initial in-port period of the year with dependents cruises (3-4 January) and a VIP cruise (6 January). 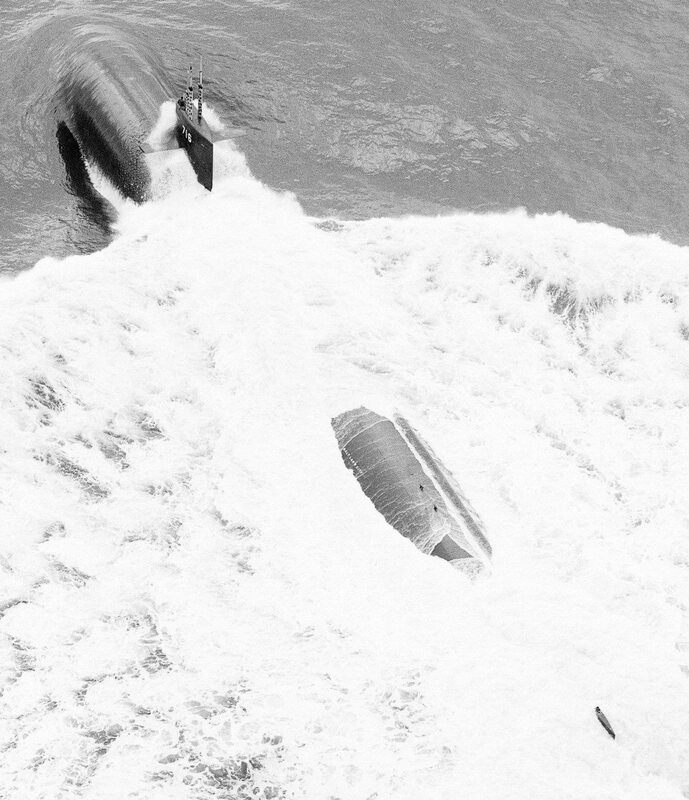 She then conducted mother submarine operations with a deep submergence unit (8-11 January); after which she entered the medium auxiliary repair drydock Arco on 22 January for major system upgrades, improvements, and repair work. Undocked on 26 February and berthed at Naval Base, Point Loma, San Diego , the boat remained in port through the first week of April. Following ring laser gyro navigation installation certification and local operations (9-13 April), Salt Lake City remained in port until transiting (26-30 April) to Astoria , Oregon (30 April-4 May). 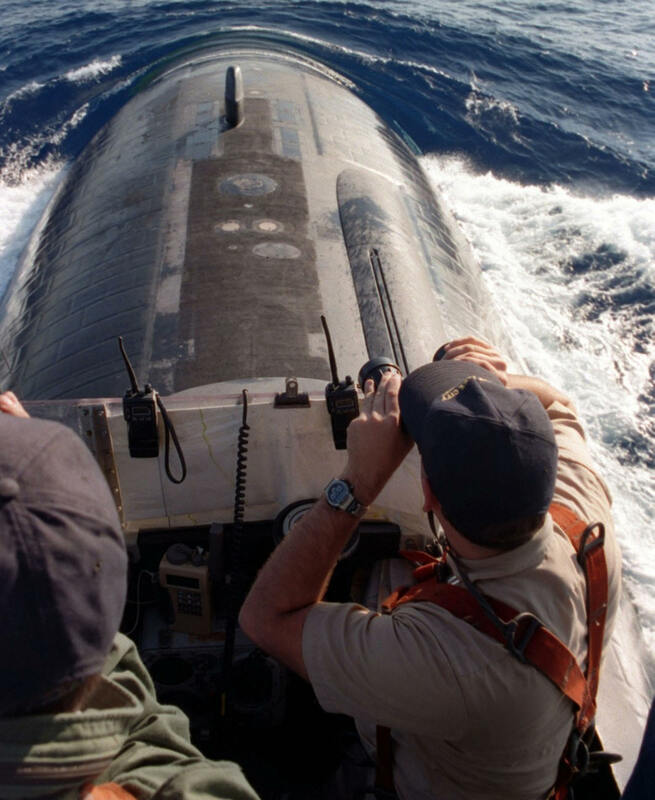 Subsequently, after providing services to sistership Bremerton (SSN-698) for that boats pre-overseas movement and certification, Salt Lake City returned to San Diego (16 May) for training and a combat readiness review. Further local operations preceded pre-overseas movement upkeep and sea trials, followed by a pre-deployment exercise with the battle group formed around the aircraft carrier John C. Stennis (CVN-74) (14-23 August), after which the boat conducted independent at-sea training. She conducted three more stints of local operations, punctuating them with in port upkeep and a pre-overseas movement certification (28-31 October), after which she participated in a second pre-deployment exercise with the John C. Stennis battle group. 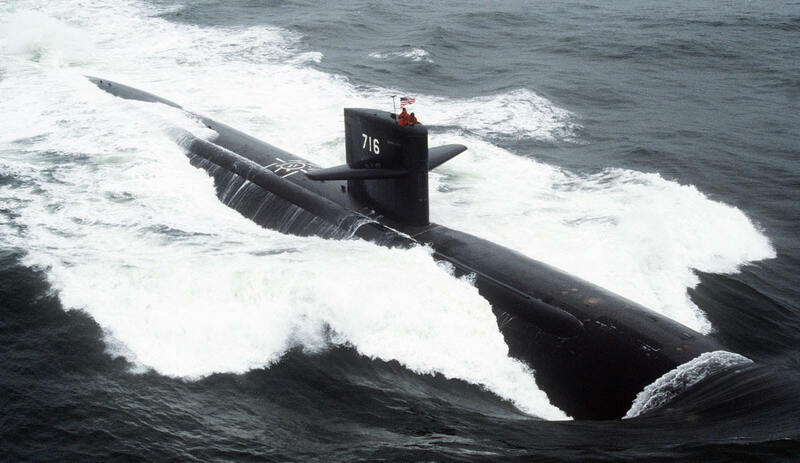 Ultimately, following two more periods import and one at sea on local operations (28 November-3 December), during which she provided services for sistership Jefferson City (SSN-759), Salt Lake City deployed on 11 December, bound for Japan. Visiting Yokosuka over Christmas (24-27 December), year’s end found the boat in transit to rejoin John C. Stennis and her consorts. After visiting Singapore (4-9 January), Salt Lake City proceeded to join the 5th Fleet, and in-chopped to that force on 15 January. Following operations with John C. Stennis’s battle group (16-26 January) in support of Operation Enduring Freedom, the ongoing efforts to eliminate global terrorist networks and to end state sponsorship of terrorism. The boat put in to Bahrain for the first of two visits during the deployment (27 January - 3 February and 22-25 April), in port periods that came at each end of a stint of transit/operations work (4 February - 21 April). In-chopping to the 7th Fleet en route to Australia (1 May), Salt Lake City visited Perth (9-13 May) before pushing on to visit Guam (22-24 May) and Pearl Harbor, in-chopping to the 3d Fleet (30 May) while en route to Hawaiian waters. 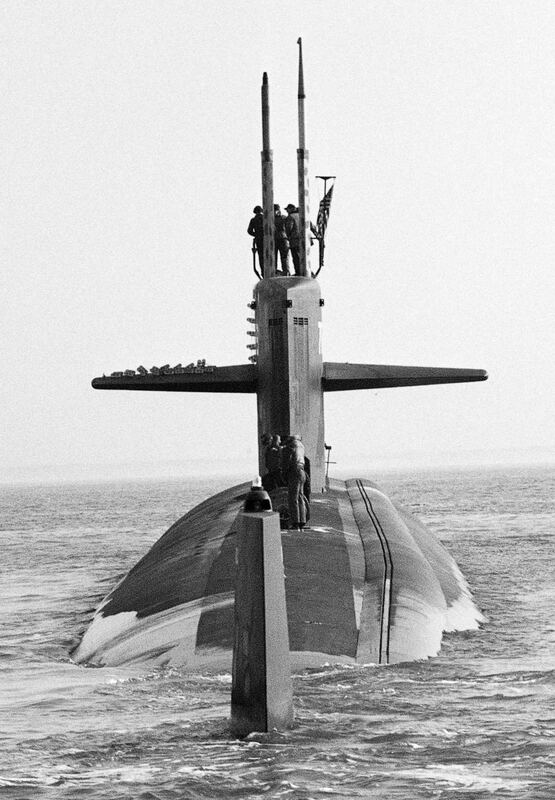 Following her brief visit to Pearl (5 June), Salt Lake City set course for home, and reached San Diego on 11 June. 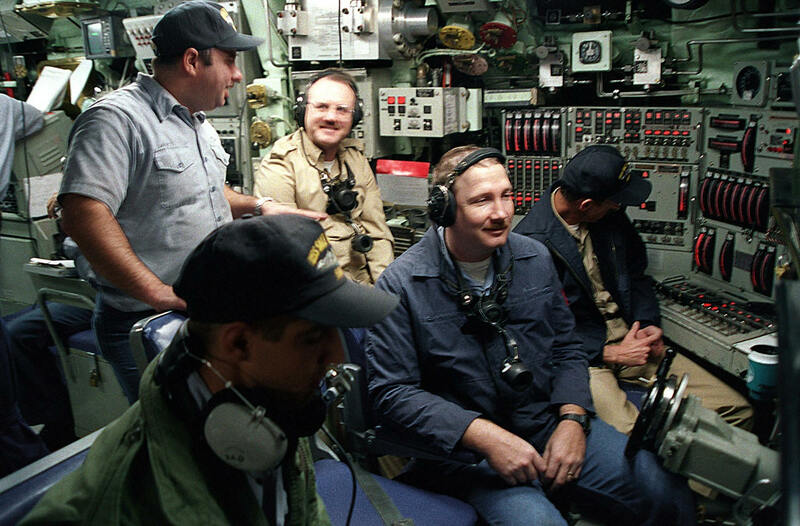 After a brief period of local operations that followed the in-port period that came after she returned from her deployment, the boat carried out brief local operations (22-24 July), after which she participated in a 3d Fleet Battle Experiment Juliet wherein she tested medium data rate communications, land attack warfare systems, and Navy fires network. 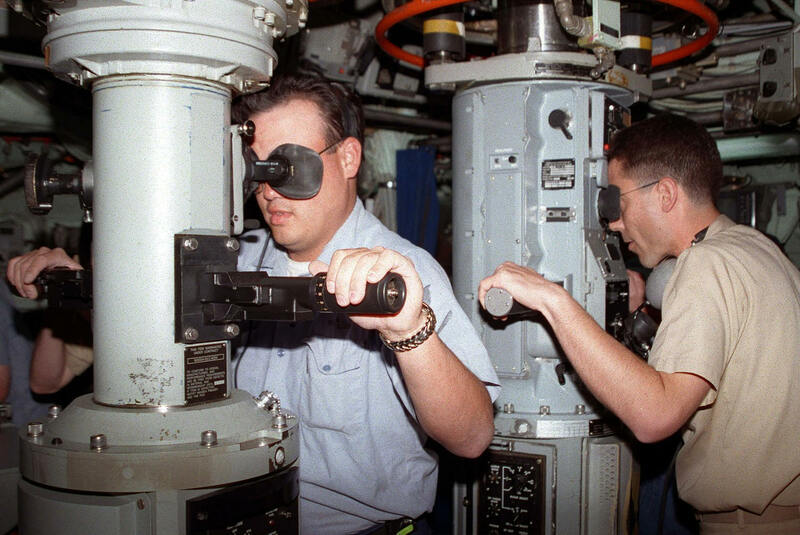 Following a maintenance availability, Salt Lake City conducted sea trials and took part in a CNO weapons text exercise, serving as the evading platform. Further training and inspections followed, after which time the boat portrayed a real world threat, harassing, and attempting to sink John C. Stennis in operations with that carriers battle group. Iin November Salt Lake City provided services to sistership Bremerton, and concluded the year with an in-port period at San Diego (14-31 December). Following her Christmas standdown, Salt Lake City conducted a stint of local operations out of San Diego (21 January - 4 February), followed by a second in port period that preceded her drydocking in Arco (19 February-24 May), during which she received new and improved systems. Following sea trials (5-9 June) off southern California, the boat sailed on 10 June for Bangor , Washington. Proceeding thence to the Behm Canal, Alaska, (19-25 June), Salt Lake City completed acoustic work at the static site testing facility there (25 June), returning to San Diego on 3 July. 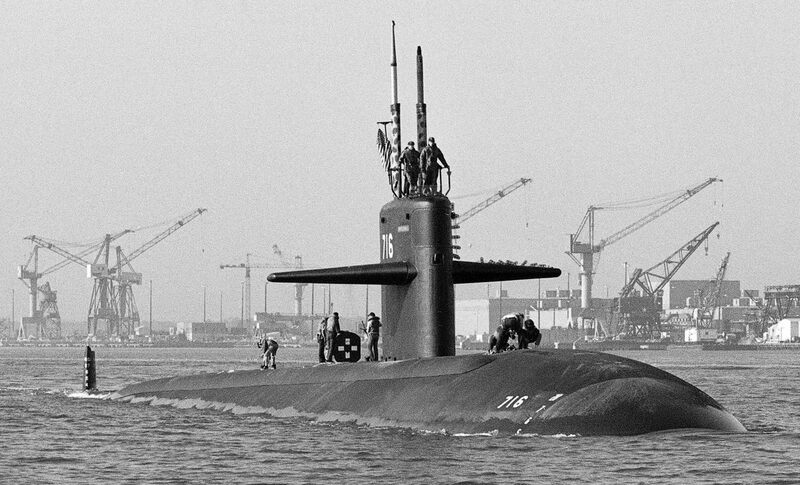 She then alternated operations at sea in the southern California operating area and in port periods until her return voyage to Bangor (11-15 September). 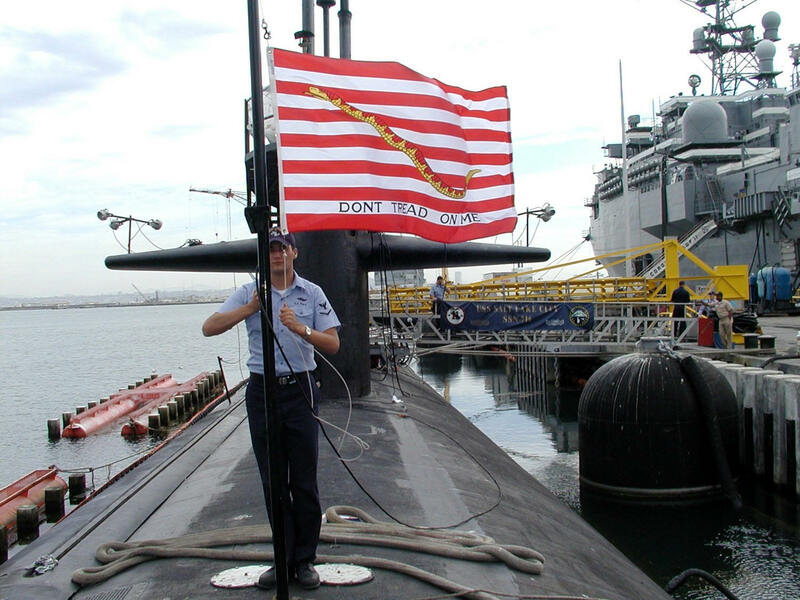 After completing weapons certification (15-18 September), Salt Lake City then returned to San Diego to resume the cycle of underway training and inport upkeep that occupied the boat for the remainder of the year. 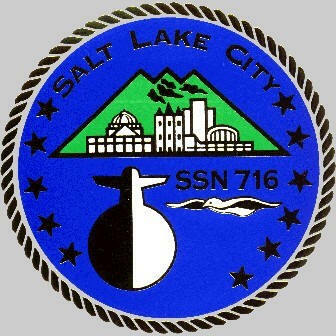 Salt Lake City began the year bringing her Christmas stand down to a conclusion, followed by an in port period. Underway on 31 January, the boat conducted a stint of local operations in support of 3d Fleet units, and carrying out on-board training. After an in-port period during which she prepared for an impending deployment, she resumed local operations, including hosting R. Lee Ermey of the History (Television) Channel’s Mail Call program. On 22 April, Salt Lake City proceeded to the western Pacific, visiting Yokosuka from 5 to 11 May. She then conducted three missions vital to national security (12 May-11 June, 17 June-2 July, 3 July-18 August and 14 September-1 October), underway periods punctuated by port visits to Singapore (11-17 June), Sasebo (2-3 July), Guam (18-22 August and 26 August-2 September), Chinhae (10-14 September) and a return call at Yokosuka (1-6 October). 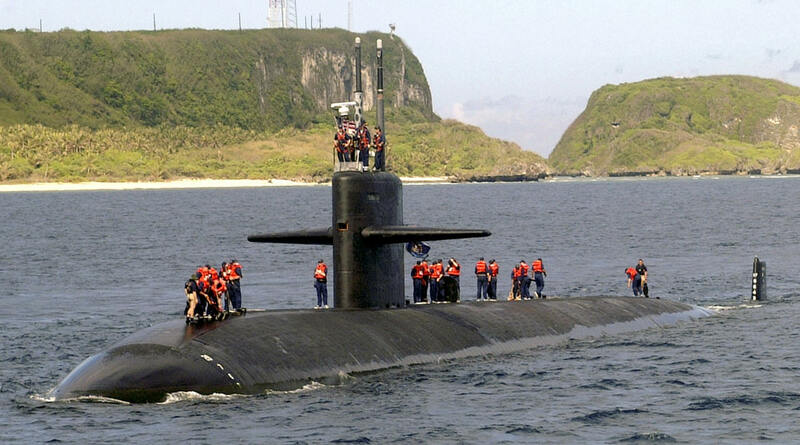 Transiting back to Hawaiian waters (6-13 October), she paused at Pearl Harbor (14-17 October). Salt Lake City returned to San Diego on 22 October, spending the remainder of the year in port with the exception of a period of local operations in the southern California operating area (29 November-1 December). 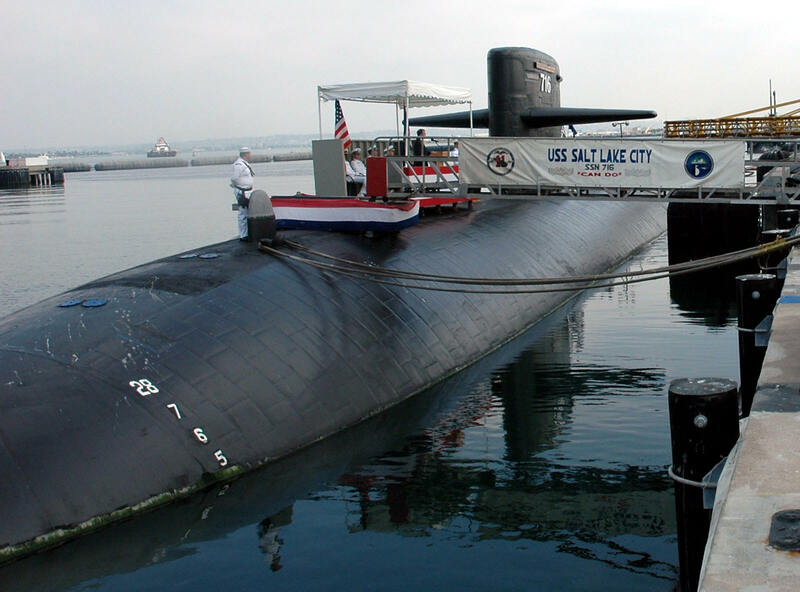 Salt Lake City conducted an inactivation ceremony in San Diego on 26 October 2005, then departed for a transit under the polar ice. 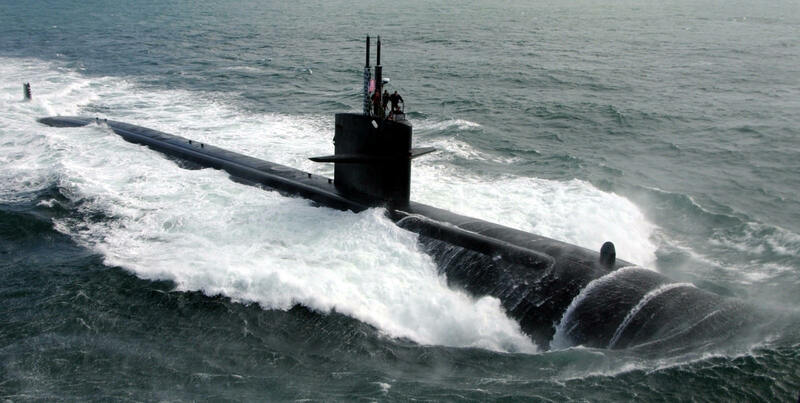 On 15 January 2006 she was decommissioned at the Portsmouth Naval Shipyard. Over a year later, the hulk was taken under tow, arriving on 8 May 2007 at Puget Sound Naval Shipyard, where she will be recycled and scrapped.